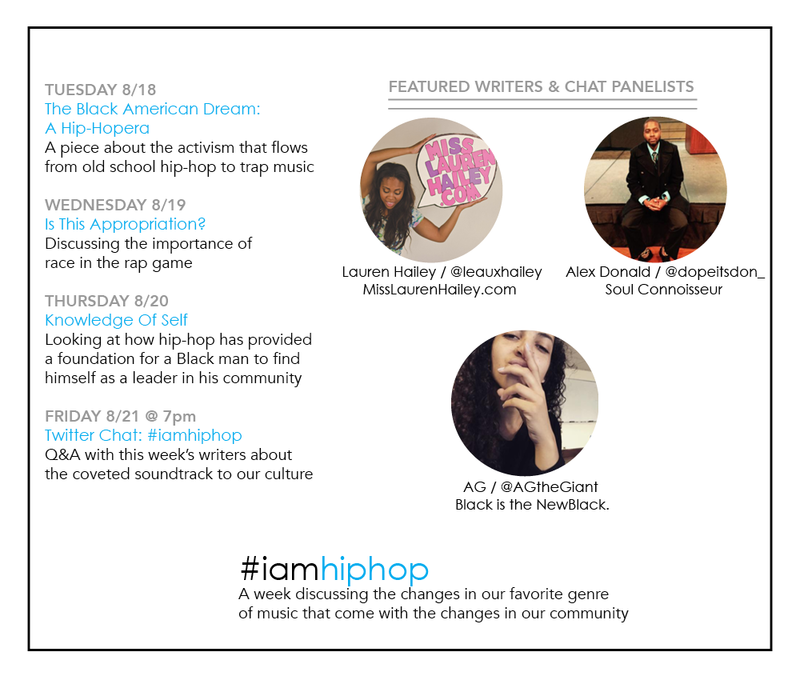 If you were on Twitter on Friday night between 7pm and 8pm (CA time) you may have seen myself and a few others talking about hip-hop and identity. This fruitful discussion looked at our changing culture in the Black community and the shift in hip-hop industry culture. Our culture has become a static topic in mainstream media and behind-closed-doors discussions. With Kendrick dropping what some have dubbed the Blackest album of the year and increased conversation around cultural appropriation, I thought we – we being Black people – needed to talk about hip-hop. 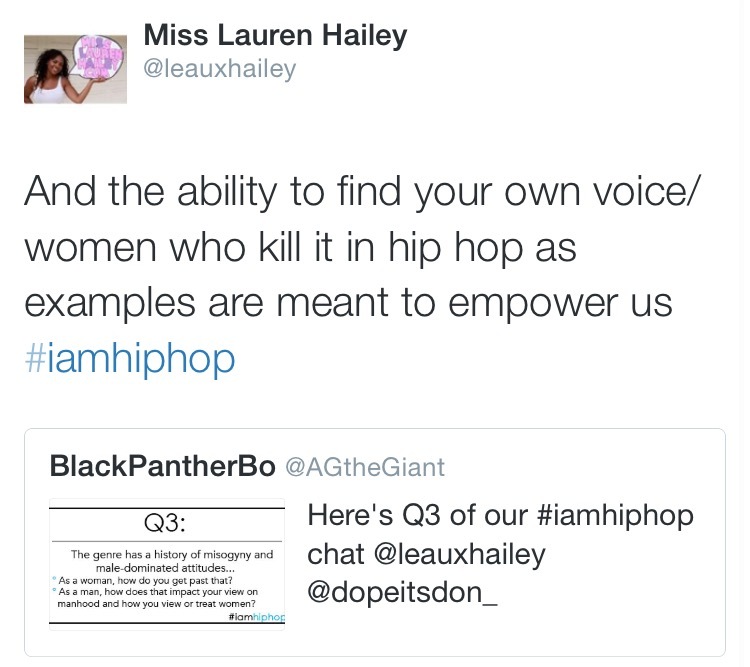 Friday’s chat was the wrap-up of the #iamhiphop series Lauren Hailey, Alex Donald, and myself had been working on. 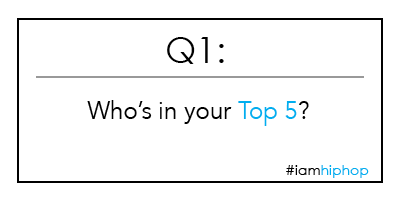 We each wrote a piece, dropped one a day, and on the final day of the series engaged in a Twitter chat that dug a little deeper into the topics we each touched on. I proclaimed hip-hop as a tool of activism in the ways that Black people have used the genre to tell their own stories of struggle and triumph. 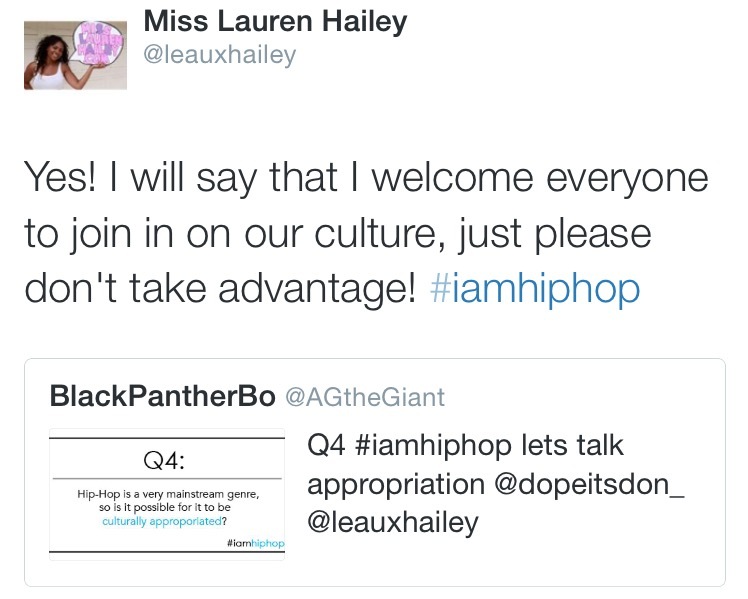 Miss Lauren Hailey wrote about the possibilities of cultural appropriation in a genre that has become so mainstream. 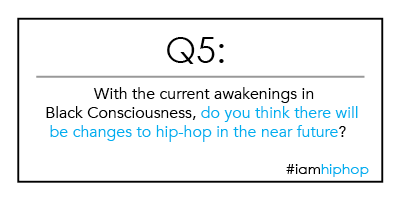 The Soul Connouisseur, Alex Donald, analyzed how hip-hop helped him find his way as a leader in his community through the types of hip-hop he feeds his mind with. The conversation got real, fast. Those in the conversation were pretty much in agreement that we can listen to misogynistic lyrics as entertainment with the mindset that those lyrics are not the lifestyle or beliefs of our own. That seems like the easiest thing to do, but the lines become blurred when we accept that those lyrics are representative of someone’s lifestyle and in a way we promote and support it when we lend our ears. 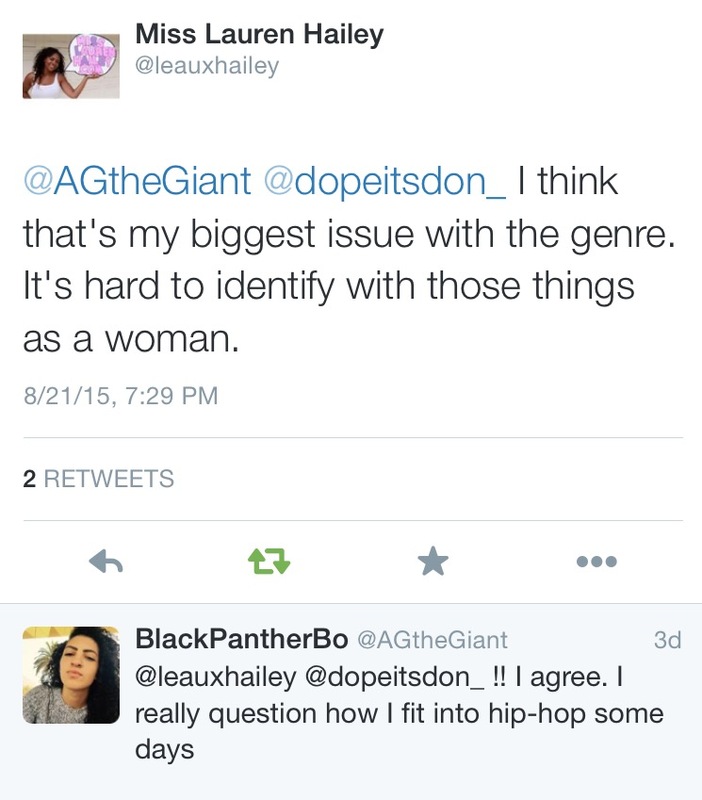 There’s no right or wrong answer when we talk about gender politics in hip-hop culture as long as we’re mindful of this source for our entertainment. Macklemore, Iggy, Miley Cyrus, OH MY! 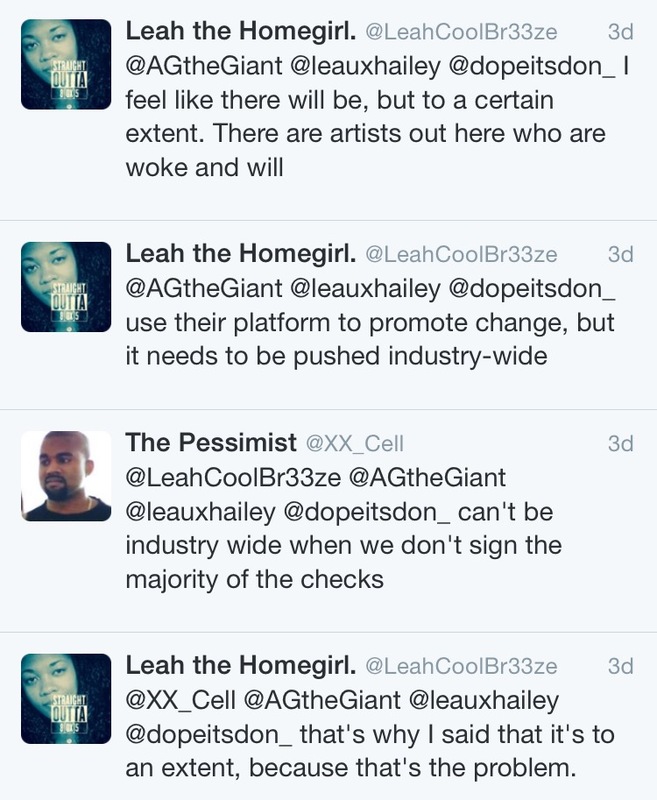 Cultural appropriation is this buzz phrase running rampant through Twitter and Tumblr, but with good reason. 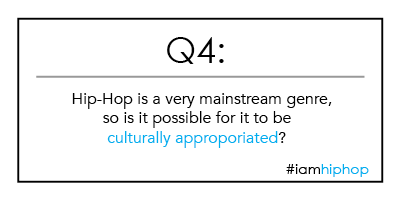 In our chat we discussed the possibility of a mainstream genre such as hip-hop being appropriated and how Black folks and hip-hop lovers alike should deal with it. 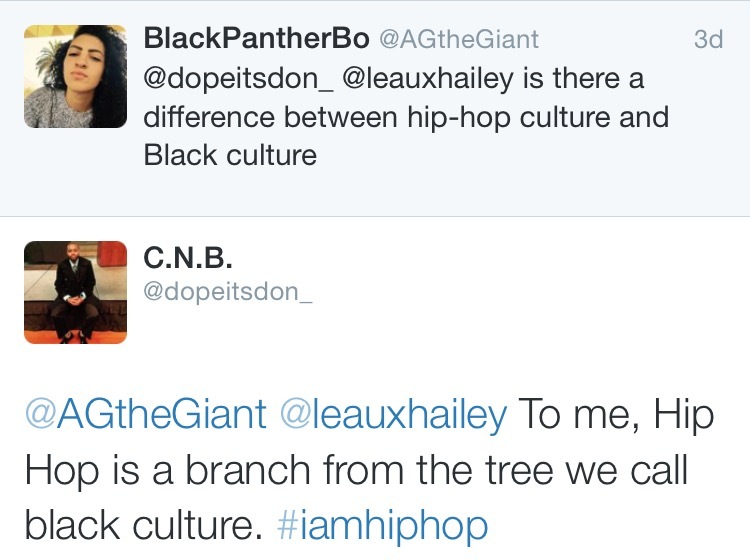 The conclusion: you can be white, or non-Black, just respect the history of hip-hop as a platform for the Black community and don’t come with wack rhymes! Respecting the history and purpose isn’t the challenge though; the challenge comes when award shows start giving out props that many in the hip-hop community can agree are wrongfully placed. 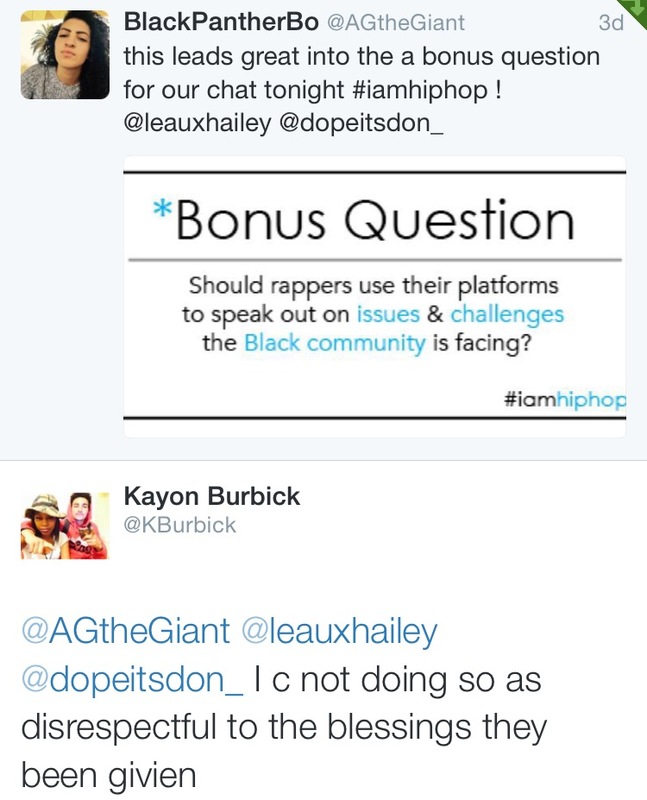 As hip-hop fans, we have to be vocal about these levels of disrespect. I know hip-hop is no longer solely part of Black culture, but that doesn’t mean that Black rappers and fans should be okay with mediocre rappers receiving trophies for participating. If it wasn’t for the Black community supporting these artists they wouldn’t be in the positions of wealth and power they reside in, so stand up and speak out for the people that got you there, period. The money is never worth more than your people. 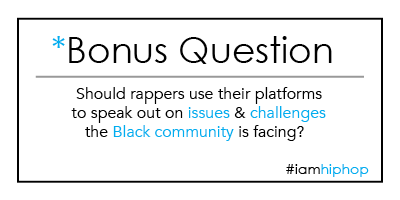 The deeper we dug into this topic the more I realized we need to talk about hip-hop’s accountability to the community that created it. As consumers we need to think about what our responsibility is to our community when we support these rappers and enjoy their music and how we navigate the lines between the lifestyles that entertain us and the realities we lead and experience. My blog is as much about identity in the Black community as it is about finding my own identity while working with/for my community, and with that comes the need to step out of my comfort zone. 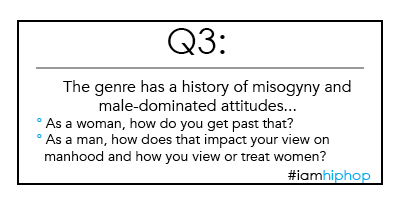 I want to facilitate discussion, I enjoy it and I find it incredibly important and in this case it meant doing something I hadn’t done before. Thank you to Lauren and Alex that wrote and participated in the series and another shoutout to those that joined in our conversation! 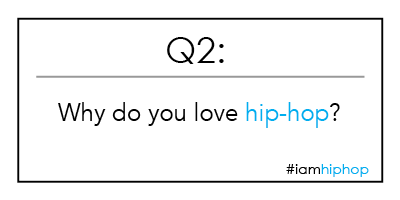 This recap didn’t capture the true depth of our conversation, so make sure to check the #iamhiphop hashtag on Twitter for more from the panelists and participants. If you have any ideas relating to Black culture and identity you would like to be expanded into a discussion or by other methods of raising awareness, let me know by commenting below or tweeting me, I would love to work on those ideas with you!